Ant-Man was supposed to be part of Marvel Studios’ first slate of films along with Iron Man. It’s been in development since 2006 and was to be co-written and directed by Edgar Wright. None of these things happened, but did the loss of a unique auteur ruin the character for film forever? The film focuses on two Ant-Men, actually. In 1989, the original Ant-Man, Hank Pym (Michael Douglas) has been involved with SHIELD for some time, but leaves the organization because they intend to abuse his greatest invention, the Pym Particle, which allows a person wearing a special suit to shrink down to the size of an insect. Cut to present day and we meet Scott Lang (Paul Rudd), a brilliant electrical engineer who turned to crime to stick it to a rich fat cat. Scott is being released from prison and finds a place to crash with his old buddy Luis (Michael Peña). He needs to find a job and straighten out his life so he can see his daughter Cassie (Abby Ryder Fortson) again. Scott’s ex-wife Maggie (Judy Greer) is now living with a cop, Paxton (Bobby Cannavale), which makes Scott’s road to seeing Cassie that much more difficult. Luis learns of a job that’s right up Scott’s alley and having no other options, Scott agrees to help Luis and his crewmates, Kurt (David Dastmalchian) and Dave (T.I.) break into a rich guy’s house and loot his vault. The house they have burgled, though, is Hank Pym’s and the thing they steal is the Ant-Man suit. Hank set the whole thing up because he needs Scott’s help to stop his former protégé, Darren Cross (Corey Stoll), from recreating the Pym Particles and selling them to the highest bidder in the form of the Yellowjacket suit. 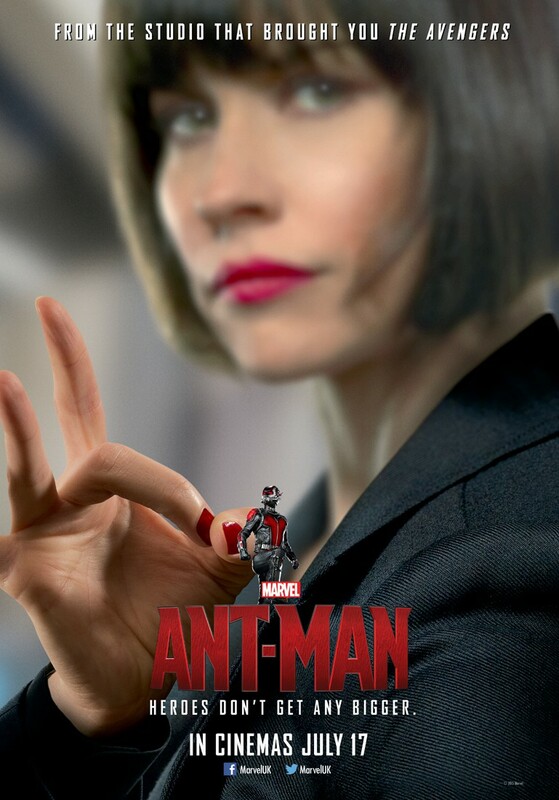 With the help of Hank’s estranged daughter, Hope (Evangeline Lilly), Scott must learn to use the Ant-Man suit and control the ants to pull off the heist and, in turn, save the world. Let’s get this out of the way right now—Ant-Man probably would have been far more fascinating if Edgar Wright hadn’t had his “creative differences” with Marvel and stayed onboard. He and his writing partner Joe Cornish are still credited on the screenplay along with Adam McKay and Paul Rudd, but as you watch the film, you can tell that the final product was cobbled together on a deadline. The new director, Peyton Reed, is competent and he does a good job keeping the whole thing on track, but it’s ultimately a thankless job, because all anyone is going to think about is “What if?” What if Edgar Wright had stuck around? Marvel has done a good job of picking directors, but as soon as the director’s vision deviates from Marvel’s overall plan, things get rocky. The studio seems to be operating much like their comic division in that the “editors” set the tone and the creators have to realize that vision. The problem is, if you asked most readers, they’d probably prefer the writers and artists do their own thing than have the stewards of the company plan out endless crossover events. The characters are nothing to really write home about and the family drama between Hank and Hope is beaten to death. Without spoiling anything, Hank has told Hope over the years that her mother died in a plane crash, but Hope knows that can’t be the truth. While she’s a super-competent character, she’s apparently not smart enough to put two and two together. Cross/Yellowjacket also proves to be another in the long line of Marvel’s weak villains. All he does the whole film is rant about how Hank never showed him appreciation and, ultimately, love, but we already get that story with Hope, so it’s redundant. Then, he’s just crazy for crazy’s sake. I’m not even really sure what his motivation is beyond getting rich…which he already seems to be. Higher personal stakes for all the characters would have ratcheted up the tension and made the film infinitely more interesting. Also, I didn’t really buy into Scott’s motivations either. Everyone keeps telling him to “be the hero [Cassie] thinks he is,” but his daughter already adores him. It’s everyone else keeping him from seeing her. Also, shrinking yourself down to the size of an ant and battling Avengers feels like a really long way to go to get regular visitation rights. I’m not knocking a guy wanting to see his kid—that’s endearing—but there are much less deadly ways to go about it. The visual effects in Ant-Man are great, with the shrinking scenes being especially good. I also really loved how they made Michael Douglas look younger in the scenes from the 80s. Visual effects artists have come a long way since the days of de-aging Patrick Stewart and Ian McKellen for X-Men 3. There is also a lot of great humor in this film, so you’ll definitely enjoy yourself, but you may walk out of the theater wondering why you didn’t love the film and it’s because the script is so slapdash. The cast does very well with what they’re given, except Stoll, who isn’t given much of anything to work with. Douglas is really good as Hank Pym and there are a few scenes where we see flashes of the famous Hank Pym anger. Rudd is a likable leading man as Scott Lang, but while he is Ant-Man in this film, the story feels more like it belongs to Hank. Lilly does a great job as Hope and my biggest complaint about her is that the filmmakers hold her back. This film should have been called Wasp and showed Hope investigating her mother’s death and learning secrets about her reclusive father, Hank Pym. Instead, she works as an inside source for Hank at Cross’ company while basically serving as Cross’…assistant, I guess? Whatever her job is for him, it’s beneath her. Michael Peña steals every scene he’s in, proving himself to be one of our most talented actors. He’s absolutely hilarious in this, so kudos to him. There are also great cameos abound from some former Marvel actors. Be sure to hang around through all the credits for two stingers—one sets up the future for Ant-Man and the other offers a glimpse at the world of the upcoming Captain America: Civil War. Overall, Ant-Man is decent, but far from great. It feels very cookie-cutter and that is quickly becoming the biggest criticism for Marvel’s films. Guardians of the Galaxy Director James Gunn claimed that Ant-Man was the best Marvel film since the first Iron Man, but it’s not even the best Marvel film since Guardians of the Galaxy. Rudd is good as Ant-Man and I’d like to see more of him, but Marvel needs to weigh the pros and cons of company plans over individuality. It’s neat when the Marvel films crossover and intermingle, however, if all the films end up being the same, the whole endeavor will get stale very quickly. For me, Ant-Man was the first hint of this staleness.